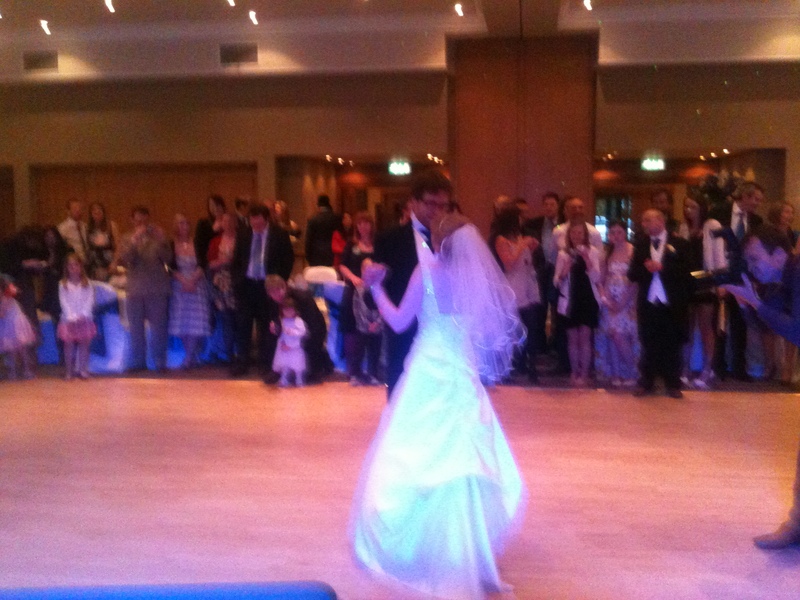 18th May ’12 – Was hired to provide my wedding DJ services at Craxton Wood in Cheshire. First time I’ve played at this fab venue just on the outskirts of Chester. Rachel & Ben had hired me to provide music throughout the whole day, starting with the service. This is only the 3rd time I’ve been required for the service, but have to say, it works well, much better than some tinny little stereo! I played a selection of music as guests arrived, then Etta James ‘At Last’ for the bride’s entrance. A nice song but also a private joke as it had been a long engagement! I also played music during the signing & the walk out. After the service, we got the room ready for the wedding breakfast. I have a radio microphone guests can use for the speeches. Rachel had also given me a song list for throughout the wedding breakfast. Once the wedding breakfast was finished, it was time to turn the room around for the evening reception. During this time, the guests were kept entertained out in the grounds with some giant garden games & a wii set up in an inflatable tent! I know I spoke to you at the end of the night on Friday but I just wanted to send a quick message to thank you again for providing the perfect soundtrack to our day. It was so reassuring to know that a professional was taking charge of the music throughout. The equipment for the day was just right, in that it allowed us to play some great background music for people to enjoy, without it being intrusive. Then in the evening, well I think it was the best Wedding disco we’ve ever been to. So many of our friends have come back to us since telling us how fantastic they thought it was. You will have guessed that music is really important to us. It was great to be able to have the list of suggested tracks, but your flexibility in letting us change things round when the different groups of guests left or hit the dance floor just made it amazing. It helped make what might just have been a good day one of the best days of our lives. We will certainly pass your details to any of our friends who are looking for music for any function. So, if you’re looking for a reputable wedding DJ for your big day in the Cheshire/Chester area, email you’re enquiry to andy@andybevents.co.uk As a guide, prices start from £275 to cover playing times of 7.30pm till midnight. I charge an additional £30 per hour for any extra time which could include your wedding breakfast. This gives you music throughout from a quality PA system, use of the wireless microphone for speeches etc, & I will also act as host as required, making any necessary announcements etc. I can even cover your ceremony if you want to make sure the music is right for this most important part of the day!